As Syrian president Bashar al-Assad struggles to contend with a massive popular uprising, the Syrian Muslim Brotherhood (SMB) is poised to dominate whatever coalition of forces manages to unseat the Baathist regime. Though in many ways the Brotherhood's official political platform is a model of Islamist moderation and tolerance, it is less a window into the group's thinking than a reflection of its political tactics. Unlike its parent organization, the Egyptian Muslim Brotherhood, which often kept its ideological opponents at arm's length, the SMB has repeatedly forged alliances with secular dissident groups even as it secretly tried to negotiate a deal with the Assad regime to allow its return from exile. Since the moderation of its political platform over the past two decades has clearly been intended to facilitate this triangulation, it does not tell us much about the ultimate intentions of the Syrian Brotherhood. The Syrian Muslim Brotherhood has openly declared its support for the current protests but has denied responsibility for organizing them. The demonstrations, they claim, are not led by the SMB but by the newly formed Syrian National Council, which proposes to unite all opposition groups including SMB members. The SMB was established in 1945-46 by Mustafa as-Sibai as a branch of Hassan al-Banna's Muslim Brotherhood in Egypt. Though favoring the establishment of an Islamic state in Syria, it participated in parliamentary elections after the country gained independence in 1946 (winning 4 seats in 1947, 3 seats in 1949, 5 seats in 1954, and 10 seats in 1961) and even had ministers in two governments. When the secular, nationalist Baath party took power in 1963, it quickly moved to weaken the SMB and the urban, Sunni merchant class that supported the movement. The group was outlawed in 1964, and its leader Isam al-Attar was exiled. That same year, a revolt led by the SMB erupted in the city of Hama and was quelled by force. During the 1970s, relations between the SMB and President Hafez Assad (r. 1970-2000) deteriorated into large-scale violence. Although the Brotherhood's opposition to Baathist rule was expressed ideologically in polite company, there was a deep sectarian undercurrent, as the Assad regime was dominated by Alawites, a schismatic Islamic sect viewed as heretical by religious Sunnis. Armed elements of the SMB assassinated government officials and carried out bombings of government buildings, Baath party offices, and other targets associated with the regime. In 1979, the SMB carried out a massacre of eighty-three unarmed Alawite cadets at an artillery school in Aleppo. In June 1980, it is said to have made an assassination attempt against the president, who allegedly retaliated by ordering hundreds of captured SMB prisoners gunned down in their cells. Although the SMB has always maintained that it had no connection to underground, armed factions responsible for violence, few take the claim seriously. In 1980, the Assad regime issued Law No. 49, making membership in or association with the SMB a crime punishable by death. In December 1980, the SMB issued a manifesto that included a detailed program for the future Islamic state in Syria. It continued to work clandestinely in predominantly Sunni, urban centers outside of Damascus, particularly in the city of Hama, and it was there that the Assad regime is reported to have notoriously massacred tens of thousands of people in February 1982, effectively bringing armed resistance to a halt. The SMB was no longer able to work openly inside Syria, and its leadership was dispersed in exile. As its influence in the country diminished, SMB leaders increasingly sought alliances with secular opponents of the Assad regime. Shortly after the Hama massacre, the SMB began working to forge a united opposition front with secular dissidents. In March 1982, it joined with the pro-Iraqi wing of the Baath party and other militant, secular opposition groups to form the National Alliance for the Liberation of Syria. This alliance called for a constitutional, multiparty democracy with Shari'a (Islamic law) as the basis of legislation. In 1990, the SMB and a broader array of opposition groups met in Paris and formed the National Front for the Salvation of Syria with similar declared objectives. With the election of Ali Sadr al-Din al-Bayanouni as general supervisor in 1996, the Brotherhood began secret negotiations with the government, which for its part felt more secure in offering greater accommodation of religious groups after its suppression of the Islamist uprising of the early 1980s. After the ascension of Bashar al-Assad, the regime released several hundred Brotherhood members from prison. Some SMB figures were allowed to return to Syria (most notably Bayanouni's brother, Abu al-Fatih), and the regime also allowed the publication and sale of some previously blacklisted books by SMB founder and ideologue Mustafa as-Sibai. After these gestures, the SMB began to rapidly shift its political platform. It firmly renounced violence, implicitly recognizing the legitimacy of Assad's rule. However, Assad refused to grant Bayanouni's three core demands: the release of all SMB members from prison, permission for all exiles to return home, and a lifting of the government's ban on the Brotherhood. Meanwhile, the SMB continued its outreach to other opposition groups. In August 2002, it met with several opposition factions in London and issued what was known as the National Pact in Syria. This pact further refined the SMB's new vision of citizenship, rule of law, democracy, pluralism, equality, and nonviolence. In December 2004, the SMB published a program for the creation of a modern civil state under the title, "The Political Project for the Future Syria." It is characterized by the rule of law, pluralism, civil society, and the peaceful alternation of political power. The SMB emphasized that it was undergoing a process of self-revitalization through reconsidering the past, the present, and the future. Islam is enshrined as "a code of conduct for the devout Muslim," a "civilizational identity" for all Syrians, the official religion of the country, and the highest source of legal authority, yet such liberal principles as democracy, pluralism, and tolerance were also affirmed. The SMB also called for the acknowledgment of other principles such as coexistence, human rights, and nonviolence. Do they have the courage to openly declare their new beliefs and apologize for their past so that we won't need to dig up their past? They are calling [now] for a pluralistic, democratic society ruled by the principles of justice and equality. On what basis are they going to build this society?... Have they changed their fundamental beliefs? Why don't they give an answer to this question?... They used to commit crimes [and then] escape to Saudi Arabia, Iraq, or Jordan [in order to find] a safe haven, and now they are planning to return from these safe havens to the scene of their crimes to participate in building a democratic, pluralistic society based on justice and equality?! Although Sultan is no friend of the Assad regime, her views on the SMB correspond with those held by many in the Syrian government. In October 2005, the SMB joined five secular opposition parties and independent political figures in signing the Damascus declaration. While emphasizing the role of Islam as the "ideology of the majority" and "prominent cultural component in the life of the nation and the people," the declaration called for the "establishment of a democratic national regime." Moreover, reflecting the sensibilities of dissidents inside Syria who fear being arrested, the declaration pointedly called for a reform process that was "peaceful, gradual, founded on accord, and based on dialogue and recognition of the other"—that is to say, led by the regime. A few months later in March 2006, the SMB aligned itself with former vice president Abd al-Halim Khaddam, one of the most powerful figures in the Assad regime until his defection in late 2005. In Brussels, Khaddam and Bayanouni joined a host of less illustrious Syrian exiles in establishing the National Salvation Front (NSF). Unlike the signers of the Damascus declaration, NSF members explicitly called for regime change, albeit through peaceful means. The SMB alliance with Khaddam was deeply unpopular among the movement's rank and file and was roundly criticized by prominent Damascus declaration signatories. Riyad at-Turk lambasted Khaddam for his involvement in crimes committed by the Assad regime and warned that this alliance would cause internal disputes within the opposition. Some exiled opposition figures, such as Farid al-Ghadri, also objected. We are members of the [Damascus] declaration and members of the NSF, and we asserted that membership in the NSF does not conflict with membership in other alliances or fronts… We are now in the midst of a peaceful opposition to bring about democratic change in the country, and we are willing to partner with all the national groups. But Bayanouni's commitment to the NSF was uneven. As the front was called into being, the SMB issued "an appeal to the free of the world to abolish Law No. 49," the implication being that it was still willing to return amicably to Syria in exchange for a full amnesty and legalization of its activities. During the 2006 Israel-Hezbollah war, when Syria and Hezbollah were winning plaudits in the Arab world, Bayanouni announced that the SMB had decided to freeze its activities against the regime temporarily. A year later, however, he was back to calling on Assad to step down and threatening to launch a campaign of demonstrations and civil disobedience. Bayanouni seems to have believed that the SMB's alliance with Khaddam, who has long-standing ties to the Saudis and the family of the late Lebanese prime minister Rafiq Hariri, would open up channels with Washington and facilitate defections from the Syrian regime. He claimed that there was pervasive dissatisfaction among the military and intelligence forces and that these forces would move against the regime if they had international support. "When there is a favorable international position sympathetic to the Syrian people, they will arise and move," he said. In his efforts to appeal for Western sympathy, Bayanouni went so far as to say that Islamist movements in the Arab world should be willing to accept the election of a woman or a Christian as president. However, the NSF failed to deliver. The alliance with Khaddam damaged the SMB's credibility in the eyes of many Syrians, and for very little return. By the fall of 2008, it was clear that Western and Arab governments were committed to reengaging the Assad regime. The MB suspension of their opposition activities against the regime has nothing to do with the Palestinian cause… why, after long years of conflict, has the MB elected to stand by the Palestinian people today? And has the Syrian regime already liberated the Golan and are its armies about to finish the job of the liberation of Palestine?!... The NSF believes that the worst form of weakness and inability is ceasing opposition activities and aligning one's position with the regime, the same regime that murdered and killed scores of MB members and thousands of other Syrian citizens. For his part, Bayanouni accused Khaddam of adopting an opinion similar to that of Israel regarding the war in Gaza and cited this as the reason for the SMB's withdrawal from the NSF. The SMB waited for the regime to reward its about-face. In a November 2009 interview, Bayanouni stressed that the group's suspension of opposition activity was conditional upon a positive response from the regime. "There were several general positive promises made by the regime to some mediators, which we welcome, but we still wait for actions. Until now, nothing has changed, and this shows that the problem is with the regime, not us," he said. In July 2010, the General Council of the SMB gathered in Istanbul and elected Muhammad Riad al-Shaqfa to succeed Bayanouni as supervisor general. Many expected Shaqfa to take a less compromising position toward Assad as he was from Hama and had played an active role in the SMB insurrection before leaving Syria in the late 1970s. His deputy, Muhammad Farouq Tayfor, is also from Hama and also took part in armed struggle during the 1970s. A month after being elected, however, the new general supervisor affirmed that the SMB would continue to suspend opposition activities against the Syrian regime. After Shaqfa's election, Muhammad Said Hawwa, son of the former SMB leader Said Hawwa (d. 1989), wrote a letter to the Brotherhood outlining a "road map" to rebuild its relations with the regime. He argued that in order to end this historical crisis, the SMB must "handle the consequences of its historical, political, philosophical, and military mistakes" and "the leaders who were involved in the past historical mistakes should give up all their posts since they led the SMB into the dark tunnel." He stressed that the SMB should accept the regime's offer to allow the return of some individuals without blood on their hands. Given the present political situation and the declining influence of the SMB, it should not expect more. Hawwa also noted that certain Muslim Brotherhood leaders demanded the impossible and attempted to impose their own conditions as if they were the victors. Instead, they should accept the regime's offers as a starting point for negotiations between the two and later on expand them to include more SMB demands. This view was endorsed by Kamal al-Halbawi, a London-based Muslim scholar and former SMB spokesman, who wrote an article in al-Quds al-Arabi calling on the new SMB leadership to work toward ending its historic dispute with the Assad regime. He urged the SMB to go back to working within Syrian social institutions, rather than letting new generations bear the brunt of a feud in which they had no part. A more significant influence on Shaqfa's thinking was the SMB's increasingly close relations with Turkey's Islamist Justice and Development Party (AKP), which also enjoyed warm ties with Assad. According to Shaqfa, there were several mediation attempts between them and the Syrian regime, but they all failed due to the regime's refusal to fully lift restrictions on the SMB. "Bashar is softer than his father, and he talks to mediators... but he always says 'now we are busy,'" remarked Shaqfa. "We would like the Turkish government to intervene to solve the problems," he said in October 2010. In a November 2010 interview, Shaqfa said that the SMB was even willing to stop calling itself the Muslim Brotherhood if allowed to go back "home" and if the regime met its long-standing conditions. The proliferation of popular protests across the Arab world during 2011 changed much. When initial calls for demonstrations in Syria in February fell flat, the SMB remained cautious in its statements about the regime. By March, however, the contagion had hit Syria with a vengeance, and its streets swelled with citizens calling for freedom and democracy. The regime accused the SMB of collaboration with Western countries in steering these demonstrations and fomenting armed attacks against the security forces. Though the SMB openly declared its support for the protests, it denied responsibility for organizing them. The demonstrations "are not led by the SMB or any other party or group," said Shaqfa. "We are supporters, not creators. The voice of the street is a spokesperson for itself," explained SMB spokesman Zuhair Salim. The SMB might have been willing to reconcile with Assad had the Syrian president been willing to abolish Law No. 49 and lift other restrictions on the movement's activities, but no such concessions were forthcoming. "If I go back to Syria, I could be arrested," Shaqfa complained in June. Worldwide support for the uprisings and Assad's recalcitrance led the SMB to fall back on its old demand for the toppling of the regime. 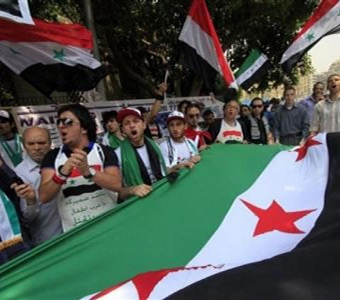 Although Salim said that the Brotherhood "would consider dialogue with the Assad government, under certain conditions, if the violence against protesters were to stop," he was surely aware that the Syrian president could not end the repression without inviting a tsunami of mass mobilization against the regime. Shaqfa has been far more concerned with shoring up the SMB's primacy over other opposition factions. When the Syrian opposition held a four-day conference in Turkey at the end of May, SMB delegates "made sure their presence was noted by arriving late for the opening ceremony, noisily chanting 'God is great,'" noted The Washington Post. However, it is not such displays of religiosity that lead many secular opposition leaders to distrust the Brotherhood but its long history of mercurial political shifts over the past three decades. "Those thirty years destroyed their organization, and they lost their legitimacy because they changed positions so much without explanation over the past five years," said Burhan Ghalioun, a prominent dissident and scholar at the Sorbonne in Paris. In October 2011, a Syrian National Council, comprising seven opposition factions including the SMB, was formed in Istanbul. Elected as council leader, Ghalioun reassured The Wall Street Journal that there was no real chance of an Islamist takeover since the SMB's thirty-year-long exile had deprived it of a solid domestic base. The SMB, however, was more upbeat. "I believe that the Assad regime will collapse within the next few months... the regime's days are over," Shaqfa prophesied, stressing that the SMB was sufficiently rooted in Syria as to make this long-cherished dream a reality. Whether this prediction will come to pass remains to be seen. Yvette Talhamy served for three years as a teaching fellow at the University of Haifa's department of Middle Eastern studies. She is the author of articles published in the British Journal of Middle Eastern Studies, Middle Eastern Studies, and Chronos History Journal. Raymond A. Hinnebusch, "The Islamic Movement in Syria: Sectarian Conflict and Urban Rebellion in an Authoritarian-Populist Regime," in Ali E. Hillal Dessouki, ed., Islamic Resurgence in the Arab World (New York: Praeger, 1982), p. 151. Hanna Batatu, "Syria's Muslim Brethren," MERIP Reports, Nov.-Dec. 1982, p. 17. Hinnebusch, "The Islamic Movement in Syria," p. 157. Batatu, "Syria's Muslim Brethren," p. 20. "Al-Mashru as-Siyasi li-Suriya al-Mustaqbal," The Arab Orient Center for Strategic and Civilization Studies (London), Dec. 19, 2004. R. Hrair Dekmejian, Islam in Revolution: Fundamentalism in the Arab World (Syracuse: Syracuse University Press, 1995), p. 109. Umar F. Abd-Allah, The Islamic Struggle in Syria (Berkeley: Mizan Press, 1983), pp. 201-67. Middle East Watch, Syria Unmasked: The Suppression of Human Rights by the Assad Regime (New Haven: Yale University Press, 1991), pp. 17-21. Thomas Collelo, ed., Syria: A Country Study (Washington: Library of Congress, 1987). "Syria: National Alliance for the Liberation of Syria (1980-1990)," Immigration and Refugee Board of Canada, SYR32163.E, June 1, 1999. "Syria Profile," BBC News, accessed Dec. 21, 2011. Sami Moubayed, "No Room for Political Islam in Syria," Asia Times (Hong Kong), May 10, 2010. "Al-Mithaq al-Watani fi Suriya," Syrian Human Rights Committee, London, Feb. 11, 2004. "Al-Mashru as-Siyasi li-Suriya al-Mustaqbal," Dec. 19, 2004. Najib Ghadbian, "Syria's Muslim Brothers: Where to Next?" The Daily Star (Beirut), Sept. 17, 2010. "Syrian Expatriate Asks: Who Are the Muslim Brotherhood Trying to Fool?" The Middle East Media Research Institute (MEMRI), Washington, D.C., Aug. 3, 2005. Middle East Transparent, Oct. 16, 2005; Damascus declaration, Oct. 16, 2005. "Conference Final Statement: Founding Conference for the National Salvation Front for Syria," Free Syria (London), June 5, 2006. Elaph (London), Mar. 19, 2006. "Bayanouni interview (6/7)," The Syria Monitor, Center for Liberty in the Middle East, Washington, D.C., June 8, 2006. "An Appeal to the free of the world to abolish rule 49\1980 that legalizes crime," Free Syria, Apr. 22, 2006. "News Round-Up (8\29-9\1)," The Syria Monitor, Sept. 28, 2006. "Al-Bayanouni lays the foundations of the modern concept of citizenship among the Muslim Brotherhood," Free Syria, Nov. 1, 2007. Asharq al-Awsat (London), Apr. 5, 2009. "Statement by the General Secretariat of the National Salvation Front in Syria: On the Withdrawal of the Muslim Brotherhood from the National Salvation Front!" Free Syria, Apr. 11, 2009. Al-Intiqad (Beirut), June 6, 2008. "Bi-Wduh," al-Hiwar TV (London), Nov. 15, 2009. "Muhammad Riyad ash-Shaqfa," www.IkhwanWiki.com, Feb. 20, 2011. Al-Arabiya News Channel (Dubai), Sept. 8, 2010. "Ikhwan Suriya… Shaqfah Muraqiban Aman Khalafan li-l-Bayanouni," Islam on-Line, Aug. 2, 2010. "Muhammad Riyad lil-Sharq al-Awsat: 'Mawjudun fi Aghlab al-Duwal al-Arabiya wa-l-Natadakhal fi-l-sha'n al-Dakhili wa-Natawasal abr al-Internet,'" Muslim Brotherhood Movement in Syria, Aug. 8, 2010. "Najl al-Rahil Sa'id Hawa Yaqtarih Kharitat Tariq baynaha Hal al-Jama'a wa-l-Awda ila al-Bidaya," Syrian Observatory Human Rights (London), Aug. 10, 2010. "Al-Hilbawi yadu ila Fak al-Ishtibak bayn jama'at al-Ikhwan al-Muslimin wa-l-Nizam fi Suriya," Syrian Observatory Human Rights, Aug. 15, 2010. BBC Arabic, Oct. 27, 2010. Ash-Sharq (Doha), Nov. 16, 2010. The Wall Street Journal (New York), May 17, 2011; FrontLine (Chennai, India), Dec. 17-30, 2011. Al-Rai (Kuwait City), May 29, 2011. The Wall Street Journal, May 17, 2011. France 24 TV (Paris), June 11, 2011. The Washington Post, June 2, 2011. Asharq al-Awsat, Dec. 5, 2011. Related Topics: Radical Islam, Syria | Spring 2012 MEQ receive the latest by email: subscribe to the free mef mailing list This text may be reposted or forwarded so long as it is presented as an integral whole with complete and accurate information provided about its author, date, place of publication, and original URL.